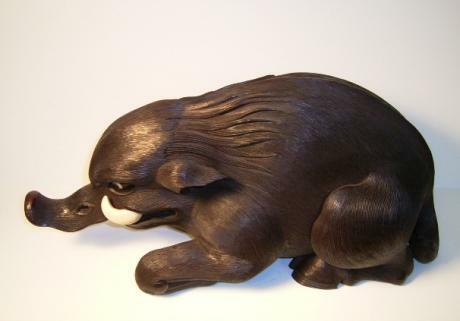 Japanese Edo Period cherrywood carving of a BAKU, the Japanese mythological animal who eats bad dreams. Large and beautiful carving with ivory tusks and eyes. Carved with such detail and expression. Unsigned. 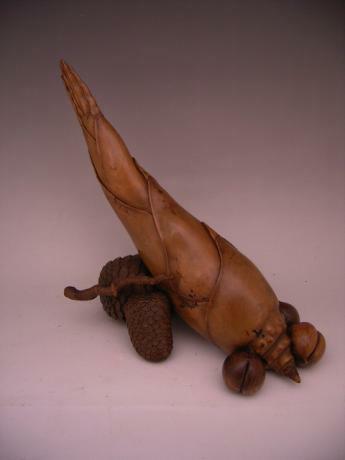 The piece measures 23" long, 10" wide and 10 1/2" tall. 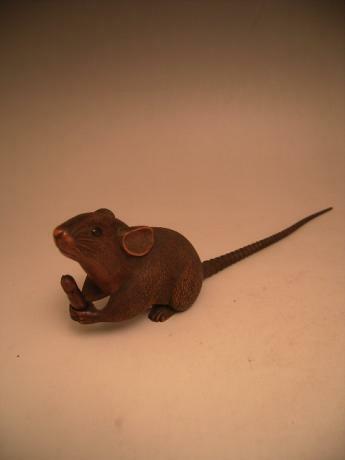 Japanese Meiji Period carved wooden rat. The figure is wonderfully carved with great facial and body expression. Signed Kagei. Comes with TOMOBAKO, original wooden artist signed storage box. The rat measures 2 1/4" tall, 8" long and 1 1/4" deep. Japanese early 20th century silver cymbidium orchid OKIMONO. The OKIMONO is done in beautiful detail and realism. 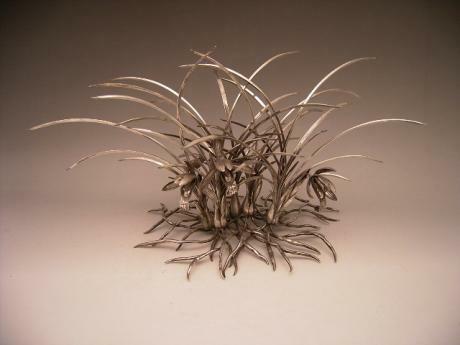 The OKIMONO is titled "Spring Orchid". Comes with TOMOBAKO, original wooden storage, artist signed box. 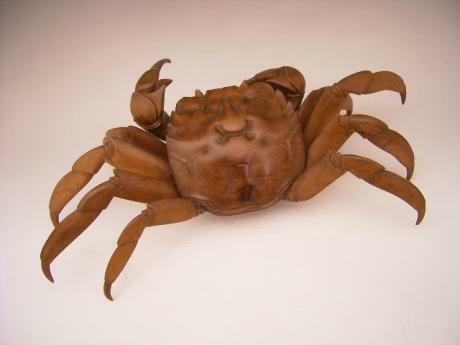 The OKIMONO measures approximately 8" tall, 15" wide and 8" deep. 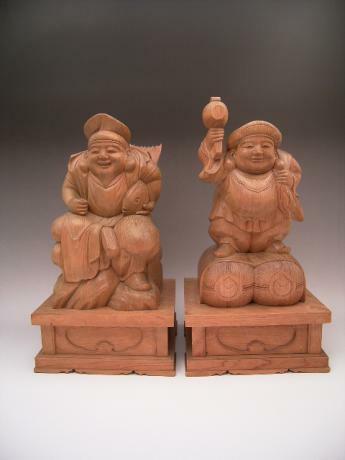 Japanese mid 20th century wooden carvings of Daikoku and Ebisu. The beautifully carved pair was actually made around the 1960's or earlier as according to the writing on the back, they were presented to a family in the fall of 1962. 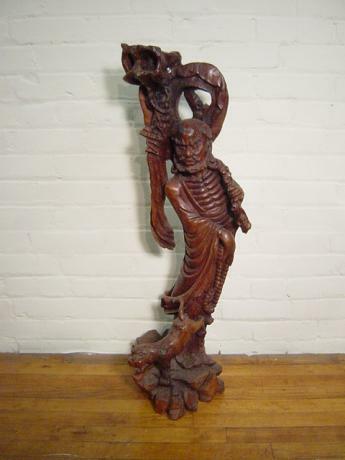 Daikoku is signed by artist in back, but they were both obvious..
Japanese Meiji Period large wooden carving of frog. Beautifully and realistically carved. Signed by artist, SEI JAKU, on underside of frog. Comes with storage box. 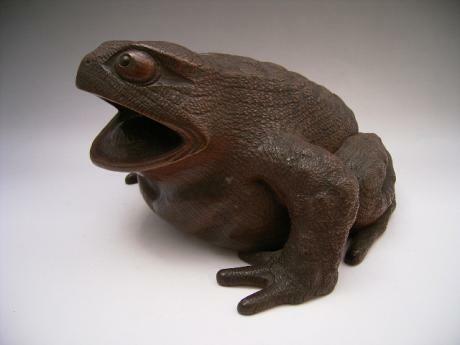 The frog measures 10" wide, 12" deep and 6 1/2" tall. Nice wooden carving from the mid 20th Century. 35" height, 10" width by 10" depth.